We’d love your help. Let us know what’s wrong with this preview of The Fountains of Silence by Ruta Sepetys. Madrid, 1957. Under the fascist dictatorship of General Francisco Franco, Spain is hiding a dark secret. Meanwhile, tourists and foreign businessmen flood into Spain under the welcoming guise of sunshine and wine. Among them is eighteen-year-old Daniel Matheson, the son of a Texas oil tycoon, who arrives in Madrid with his parents hoping to connect with the country of his Madrid, 1957. Under the fascist dictatorship of General Francisco Franco, Spain is hiding a dark secret. Meanwhile, tourists and foreign businessmen flood into Spain under the welcoming guise of sunshine and wine. Among them is eighteen-year-old Daniel Matheson, the son of a Texas oil tycoon, who arrives in Madrid with his parents hoping to connect with the country of his mother's birth through the lens of his camera. Photography--and fate--introduce him to Ana, whose family's interweaving obstacles reveal the lingering grasp of the Spanish Civil War--as well as chilling definitions of fortune and fear. Daniel's photographs leave him with uncomfortable questions amidst shadows of danger. He is backed into a corner of decisions to protect those he loves. Lives and hearts collide, revealing an incredibly dark side to the sunny Spanish city. Enter to win an ARC copy of THE FOUNTAINS OF SILENCE by From the #1 New York Times bestselling author of Salt to the Sea and Between Shades of Gray RU Enter to win an ARC copy of THE FOUNTAINS OF SILENCE by From the #1 New York Times bestselling author of Salt to the Sea and Between Shades of Gray RUTA SEPETYS! Master storyteller Ruta Sepetys once again shines light into one of history's darkest corners in this epic, heart-wrenching novel about identity, unforgettable love, repercussions of war, and the hidden violence of silence--inspired by the true post-war struggles of Spain. To ask other readers questions about The Fountains of Silence, please sign up. F I N A L L Y and ohhhhhhhhh look at that cover!! Having had twelve hours to process the book after reading it in the span of twenty-four hours including a car ride (and I don't read in the car because well, motion-sickness, but there are just times where that needs to be overcome), I can now write a review that consists of more than hearts and exclamation points. Picking stories that represent dark times in our global history is likely the easiest part, but deciding to tell it with the emotional strength and depth required can only be trusted Having had twelve hours to process the book after reading it in the span of twenty-four hours including a car ride (and I don't read in the car because well, motion-sickness, but there are just times where that needs to be overcome), I can now write a review that consists of more than hearts and exclamation points. Picking stories that represent dark times in our global history is likely the easiest part, but deciding to tell it with the emotional strength and depth required can only be trusted to a few writers. Sepetys is one of those chosen few, and chosen because three books have already solidified her ability to write historical fiction and this one is equally captivating. Her appeal lies with adults and young adults who want to access the worlds she opens up. In this story, there are four characters who intersect in mesmerizing ways: Spanish brother and sister Ana and Rafa, their cousin Puri, and the American-- Daniel. Their connections unfold in a series of suspenseful, dark, sentimental, and deeply personal ways in and around the Castellana Hilton, a hotel that's a piece of the United States inside Madrid, Spain during the tumultuous and tenuous reign of Generalissimo Franco. The policies and practices that emerge lead to tragedy that Puri begins to uncover while Daniel as an outsider who pines for Ana also discovers additional stories when using the lens of his camera. Everyone has a story to tell. There are characters you'll love to hate and characters you want to fall in love. One thing is for sure, you'll fall in love with Sepetys again. Storytelling is her passion and her purpose. And the power of the story is similar to Doerr's All The Light We Cannot See and Hannah's The Nightingale and the length and span of the story to Julie Berry's newest Lovely War. Whether readers are understanding the importance of dress for a bullfighter or poverty in Vallecas. I had no problem following the array of characters because they are all instrumental, even as the book moves forward in time and new secrets emerge, I would have gladly welcomed more. It's the nuanced relationships and evocative time period that teach us about humanity. The setting creates is own set of problems and character so anyone who has visited will easily recognize it while those who haven't (me) can understand through Sepetys' choices what we didn't experience firsthand. She's a guide for epic stories of love and loss, politics and economics. The human toll of dictatorship. The secrets and the danger of secrecy. 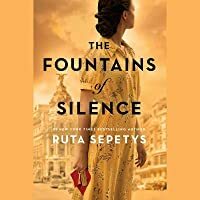 There was a constant pull to uncover and understand, so when Sepetys adds a confessional and power struggles, money and beauty, no one is ever quite certain who to trust but that in that, we can only imagine why even now there a vow of silence as Spain moves on. I'm sorry, a historical novel about Spain under the dictatorship of Francisco Franco??? Why did no one tell me about this sooner???? Ruta Sepetys delivers in this incredible historical fiction novel set in Madrid, Spain in the late 1950s during Franco's dictatorship. I lived in Madrid for a semester in college with a Spanish woman who did not speak English. I was transported back in time to the bullfights, the food, the reverence for family, the dizzying heat and of course, the fountains. The subversive use of photography by the main character Daniel captures the fear, the unseen and the forbidden in Franco's Spain. 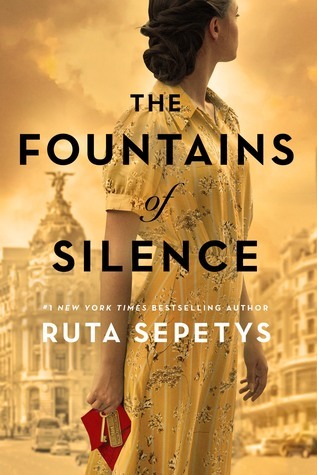 The refer Ruta Sepetys delivers in this incredible historical fiction novel set in Madrid, Spain in the late 1950s during Franco's dictatorship. I lived in Madrid for a semester in college with a Spanish woman who did not speak English. I was transported back in time to the bullfights, the food, the reverence for family, the dizzying heat and of course, the fountains. The subversive use of photography by the main character Daniel captures the fear, the unseen and the forbidden in Franco's Spain. The references to the photo-journalistic works of Robert Capa heightens the story at strategic intervals and keeps the reader guessing what is hiding beneath the facade. I also loved the mentors placed in Daniel's life, both Ben the journalist and Miguel the film store owner. I'VE DIED AND WENT TO HEAVEN. I was thrilled to receive THE FOUNTAINS OF SILENCE arc before the book's official release to the public! In this stunning novel, Ruta Sepetys illuminates the terror and cruelty Spain experienced under dictator Francisco Franco. Sepetys’ vivid characters, beautiful language, and suspenseful twists and turns held me captive and still fill my thoughts. In 1957, eighteen-year-old Daniel Matheson travels from Dallas, Texas to Madrid, Spain with his oil-wealthy parents to his mother’s homeland. He’s so I was thrilled to receive THE FOUNTAINS OF SILENCE arc before the book's official release to the public! In 1957, eighteen-year-old Daniel Matheson travels from Dallas, Texas to Madrid, Spain with his oil-wealthy parents to his mother’s homeland. He’s so focused on photography and winning the Magnum Photography Prize - to fund journalism school against his father’s wishes - that he doesn’t fully realize the contrast of his life from the average Spaniard. But soon he meets Ana and her siblings Rafa and Julia, who all battle fears and suppress the secrets of their family’s dark past. The past haunts them, binding them to silence and poverty. Their cousin Puri cares for children in the orphanage where she uncovers a shocking discovery, but Sister Hortensia thwarts her questions, leaving Puri caught between her love of country and fear of truth. Their lives converge at Castellana Hilton, the American hotel in Madrid that seems like a palace to the locals. When hotel maid Ana is assigned to work with Daniel’s family, a budding yet forbidden romance arises that introduces each of them to the other’s world. Through Ana and her family, Daniel recognizes Spain’s simple yet complex beauty and captures the poverty and the pride of Spain in his photographs. But their vows of silence create questions. Why does Rafa and his friend bury empty coffins? Why does the guardia civil threaten Daniel after he snaps a photo of a nun carrying a dead baby? Who stole Daniel’s pictures? Sepetys delivers a dramatic story of honor, loyalty, and beauty with a cloud of dread hovering just beyond reach. And love overcomes it all. True Ruta. Beautifully written yet difficult-to-read parts of history. Thankful she once again exposed a piece of hidden history to me. I flew through the pages, desperate to know how Daniel, Ana, Rafa, Julia, and Puri’s stories would end. Surprises, twists, sadness, relief, joy—this book has it all. Get your copy as soon as it is released October 2019! Another piece of history I knew nothing about. This engrossing tale of life under Franco in Spain will send me to nonfiction to learn more about the Spanish Civil War and after. I have loved all of her other books!! I was super excited to see this one on the horizon. I would love a copy to read!!! Okay so... How did I not know about this sooner? Please pick me to read the advance copy of this book. I absolutely love Ruta. I own all of her books and have purchased copies for friends and family. I don’t know how I feel about this book so I didn’t give it a rating. It’s not my kind of book; I knew that when I started. I didn’t love it at all, but I can’t really hate it, either. I felt it was slow at many points, but the research was interesting. The plot could have been fascinating, especially the wrap-up, but there was so much verbage it was hard to care. This book could have been half the length and been just fine. But... again, not my type.